For the price of the Iraq War, we could buy enough Apache military helicopters to fly all Alaskan women to Canada, so they'd still have the right to an abortion even if John McCain and Sarah Palin succeeded in overturning Roe v. Wade. Both John McCain and Sarah Palin oppose Roe v. Wade, the Supreme Court decision that protects the right to have an abortion nationwide. Roe would most likely be overturned if McCain or Palin chose the replacement for a pro-choice Justice like the 88-year-old John Paul Stevens. Then Alaska would severely restrict abortion rights for its 302,820 women. 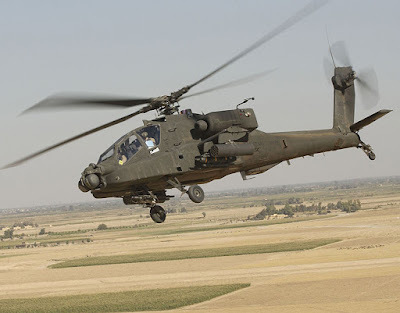 Armed with a 30mm chain gun and Hydra and Hellfire rockets, the AH-64 Apache helicopter is the primary attack helicopter of the U.S. Army. It costs $18 million and seats two crew members. With two women in each helicopter, buying enough Apache helicopters to fly the female population of Alaska to pro-choice Canada would cost $2.73 trillion, which is less than Joseph Stiglitz and Linda Bilmes' estimate of $3 trillion for the cost of the Iraq War.